You'll find some pretty good hotels in Chesapeake, Virginia. 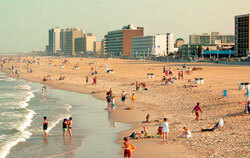 Most of them are located in the business districts of this sprawling city. 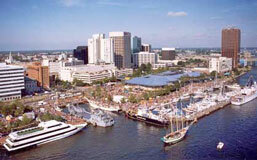 It's a typical suburban area with usual reliable chains as your choices for a Chesapeake hotel. A hotel with modern loft-inspired design. Rooms feature their signature bed, oversized showerhead, bath stuff by Bliss Spa, all-in-one office and entertainment center, free wi-fi, 42" LCD TV. Indoor pool, lounge, gym. 1454 Crossways Boulevard. Located close to office buildings and industrial parks. Ten miles to Norfolk International Airport. Walking distance or a short drive from over 50 restaurants. Hotel has 92 rooms, each with a work desk, two phone lines, complimentary high speed internet via Ethernet. Wireless high speed internet is available in public areas and meeting rooms. The restaurant serves breakfast. Indoor heated pool with whirlpool and sauna. This is your standard Hampton Inn (not a bad thing). Of course it has the usual convenient free continental breakfast. Outdoor pool. Close to the conference center, businesses and restaurants. 4449 Peek Trail. This hotel has a new state-of-the-art lobby with a bistro dining area, free wi-fi, and spaces to work or relax. There's also a fitness center and an indoor pool. Guest rooms have new flat panel tvs, coffee/tea maker, desk, etc. 1562 Crossways Blvd.